Eden Park is conveniently located less than three kilometres away from the Auckland central business district, and can be accessed via pedestrian lanes which connect the stadium with the city centre and surrounding suburbs. Eden Park is well served by arterial road, bus and rail links to the central business district and other parts of Auckland. Kingsland Rail Station is located immediately opposite the stadium while dedicated buses use special stops within walking distance and a purpose built transport facility within the stadium itself. Parking restrictions apply around the venue on match days; however special shuttles will take patrons to and from Eden Park from remote parking locations. Facilities for disabled visitors are available. The Eden Park arena has been in use for sport since around 1900. Eden Park has been the home to Auckland Cricket since 1910, and has also hosted many international Tests and international One-Day cricket matches. It is the place where Rugby World Cup began, when the inaugural Tournament kicked off on May 22, 1987 and where New Zealand became the first team to win the Webb Ellis Cup. Every year the stadium hosts almost half a million sports fans and patrons who attend matches and events. Eden Park has been a sports ground since 1900 - the home of Auckland Cricket since 1910 and Auckland Rugby since 1925. The stadium's proud history boasts some of New Zealand's greatest sporting moments, including the 1950 Empire Games, the inaugural Rugby World Cup in 1987 and the 1992 Cricket World Cup. It has also played host to many of Rugby's most famous test matches. IT is currently undergoing a redevelopment project, which includes a new three-tier South stand that will replace the old South and South West stands with a capacity of 24,000 and a new three-tier East stand to replace the Terraces. The number of covered seats will increase from 23,000 to 38,000. The redeveloped Eden Park will also feature an internal concourse that will allow people to circulate around the grounds inside the stadium and world-class facilities, including food and beverage outlets, toilets and corporate areas, are being promised. Public transport upgrades are also planned, including a transport hub, featuring a pedestrian bridge between the stadium and Kingsland Station, and a bus drop-off area. The open plan approach to the design and establishment of a community centre and green space, as well as the removal of the perimeter fence, all mean that the stadium is set to become more publicly accessible and a part of the neighbourhood. The redevelopment to a permanent 50,000 seat capacity will give spectators a world-class experience beyond RWC 2011. 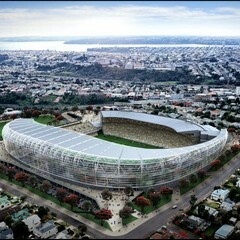 The capacity will extend to 60,000 during RWC 2011.